Artemisa Gallery is pleased to announce Cristian Segura: Art Institutions Unveiled. Cristian Segura’s practice lies within the framework of institutional critique. His early interest in art took him to work as a volunteer in museums at 14 years old, to then become coordinator of exhibitions at 19, and shortly after the director of the Museo Municipal de Bellas Artes de Tandil in Buenos Aires at the age of 23. His experience working in a museum motivated him to create work that speaks to the inner workings of museums and cultural institutions with a critical and reflexive eye. Through various media including photography, video, and installation, Segura explores notions of the conservation of artistic histories, the dependence of political and public support, as well as the idea of permanence and perseverance of the arts when a museum becomes a victim of inadequate management or the lack of resources. 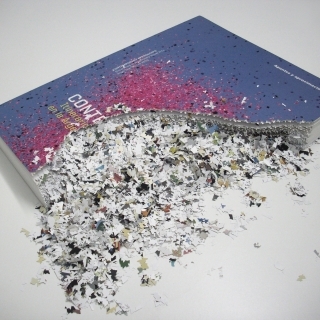 In his pierced book sculptures, Cristian Segura shreds, bends, and reworks books edited by Latin American museums, eliminating and muting their content entirely. The artist cuts up the edges of books into small pieces underlining the cultural obligations that art museums have to protect and look after the artistic patrimony that has been entrusted to them through donations and acquisitions. The use of the museum catalogue points directly to this medium as a place of officially sanctioned discourse and part of the mechanism that museum’s employ to legitimize the art itself. Segura sheds light on similar issues through various mediums. In several performances in 2011-2012 the artist used a crossbow to lunge pencils against the museum wall. Below the wall, hundreds of broken pieces of pencil filled the floor which Segura then used to create larger drawings generated by the repeated impression of graphite on the wall. This work was showcased in various cultural institutions throughout Argentina in 2011-12: Espacio Itaú Cultural C.A.B.A, Teatro Auditorium de Mar del Plata, Museo de Arte Contemporáneo de Salta (MAC), Museo de Arte Contemporáneo Latinoamericano de La Plata (MACLA). Segura’s ‘Fist’ is a video installation taken from the artist’s performance about the Museo de Arte Carrillo Gil in Mexico D.F. (2012). The video itself exists inside a sculpture of the fist of the artist that connects through a USB cord, allowing this moment in time to be experienced by the spectator. In this video, the artist energetically throws a sculpture replica of his head in 1:1 scale against the wall of the exhibition space. The head breaks the wall and stays trapped within the hole it ruptures. The museum restores the wall with Segura’s piece inside, leaving the work an element of the museum’s architectural structure. With this work, Segura invites the spectator to understand how museum’s have been able to integrate the critical eye within the institution itself. Cristian Segura was born in 1976 in Buenos Aires and currently lives and works in Tandil, Argentina. Segura’s work has been the subject of many notable solo shows including: Cristian Segura: Art Institutions Unveiled at Artemisa Gallery, New York, Sismo en chile: el museo en ruinas (3d) at Centro Cultural del Teatro San Martín, Buenos Aires (2016), Um patrimônio protegido, Galería Baro, São Paulo, Brazil (2011); Cirugía de Urgencia, Centro Cultural de España en Buenos Aires, Argentina (2011) and Argentina en Focus: Visualizando el Concepto Cristian Segura/Sergio Vega, Art Museum of the Americas, Washington DC (2010). And group shows including: Silences, Artemisa Gallery, New York (2014), the 11th Havana Biennial, Cuba (2012), the 6th Biennial of VentoSul, Curitiba, Brazil (2011) and the Trienal de Chile (2009). He has received residency grants from the Hangar, Barcelona, Spain (2008); Batiscafo, Havana, Cuba (2008) and El Basilisco, Buenos Aires, Argentina (2006). He participated in the programs Intercampos (2005) and Tec-en-arte (2009) of the Espacio Fundación Telefónica. He has won important national and international awards. His work can be found in the collections of the Museo de Arte Carrillo Gil, México City. ; Museo Juan B.Castagnino+Macro, Rosario; Museo de Arte Contemporáneo, Bahía Blanca; Fundación OSDE; Museo del Barro, Paraguay; and the Centro de Documentación Centro Cultural La Moneda, Chile, among others. He has been guest curator at the Fundación arteBA and the Dirección de Artes Visuales de la Nación Argentina.